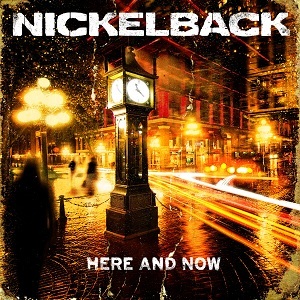 "Here and Now" is the new album from Nickelback - their seventh album to date. Over the last decade, Nickelback have become one of the biggest rock bands in the world, yet despite this they seem to get a lot of criticism. The critism they get from some quarters doesnt seem to affect them and they continue to release albums that sell in huge quantities. Despite their massive success, I must admit to only having heard a few of their songs - mainly the singles that receive airplay on the music TV channels, so I was curious to see how I'd enjoy their new album. After listening to the album a few times, it's clear why Nickelback sell so many records, and equally I can see why they get some of the criticism they receive. Musically there's actually some really good rock here in places with some good heavy guitar, but most of the album feels as though its been written with a clear focus on commerciality rather than being written from the heart. Lyrically don't expect anything too exciting, deep or meaningful - what you'll get here is pretty lightweight stuff with some sexist drivel thrown in - the chorus to "Midnight queen" is a perfect example of this. I really can't make up my mind about this album. On the one hand there is some good stuff here, but equally there's too much of a commercial focus for it to be really great. Being commercially successful is nothing wrong, but when the music sounds as though it was written purely for its commercial potential then thats when I'm not so keen. Nickelback fans will love the album and it will sell millions of copies, and it's the sort of bland inoffensive rock that will attract listeners who wouldnt normally listen to rock music, but there's nothing here that will make the band's critics change their minds.